If you see footprints on a hike, or regularly as part of your work, we want to hear from you! We want to use footprints to map endangered species around the world, and learn how to protect them better. 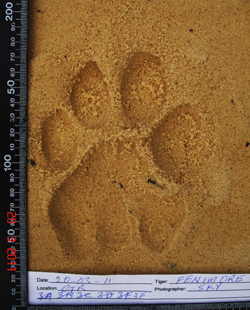 WildTrack has developed a specific footprint collection protocol. All you need is a digital camera or smartphone, a pen and pencil and a good eye to see the footprints. When you have collected your footprints, please contact us for details of how to upload them. We’re in the process of upgrading our data upload and management system to make it seamless for users. First, please take care not to disturb animals in their natural habitat and, if possible, always take an experienced local tracker with you if you are going to walk for any distance in terrain which is unknown to you. If you can, find a trail of several footprints, and choose clear prints where you can see the outlines of the toes and heel. If you only see one, that’s OK too. Align your camera lens directly overhead of the footprint and fill the camera frame. Try to take images early morning and late afternoon when the light contrast is good. Avoid casting shadow on the footprint. Place a metric ruler as the scale on bottom and left-hand axis, in relation to direction of travel. Leave about 2cm between the ruler and the print on each side. 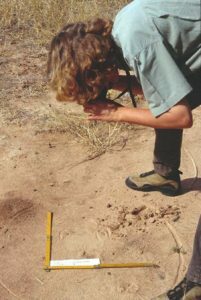 Record the date, name of photographer and any information about the animal ID, if known, on a photo ID slip just below the footprint. Include the GPS if your phone doesn’t already capture that. ‘Footprint number’ refers to the number allocated to the footprint for that day’s work. Call the first LH print in the trail 1a, the second 1b, the third 1c etc. Footprints from a second trail a bit further on will be 2a, 2b etc. If only occasional individual footprints are seen, give each a different number. Indicate which foot, if known, under ‘Foot ID’. A new feature in FIT allows for a depth recalibration. If you find prints in snow you can measure and record the depth at the center of the footprint.